This was found by a part-timer today in one of the fiction books on the children's floor. May the force be with you, everyone. *Read long and prosper. *I know, I know. But I couldn't think of a literacy-related pun for "Star Wars." Anyone? I am a jedi reader, like my father before me. I find your lack of a library card disturbing. Ron, you get a gold star! The best entry posted so far. Yep. 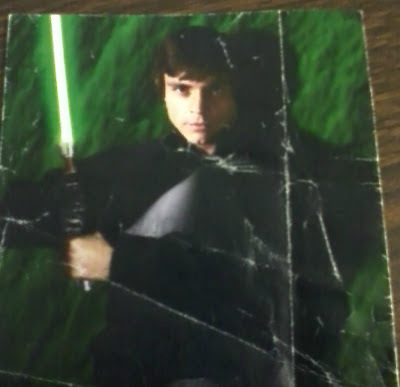 I'm Luke Skywalker. I'm here to read to you. Help me, reference librarian. You're my only hope. There is no late, there is only overdue. Book, I am your father. "These are not the books you're looking for", waving hand slowly in front of patron holding Dan Brown books.